In 100 Episodes, The A.V. Club examines the shows that made it to that number, considering both how they advanced and reflected the medium and what contributed to their popularity and/or longevity. In this edition, That’s So Raven, which ran for 100 episodes on Disney Channel from 2003 to 2007. Some Hollywood careers are composed of phases so disparate, real mental effort is required to link them together. Such is the case with Raven-Symoné, who has recently enjoyed a high-profile second act as the resident firebomb-thrower on ABC’s The View. Given her tendency to rankle the Twitterverse with rambling pronouncements about ethnic-sounding names, among other hot topics, it’s hard to remember she entered the public eye at 3 years old as the beloved Olivia Kendall on season six of The Cosby Show. Raven occupies rarefied air as one of few next-gen sitcom moppets to earn her place on the show rather than just occupying the requisite precocious kid slot in a family comedy. After landing the Cosby gig, Raven went on to make Olivia the anti-Cousin Oliver. But Raven’s most successful phase is arguably the four years she spent doing That’s So Raven, the Disney Channel kid-com so successful, it made the Disney Channel fundamentally rethink its approach to original programming. Prior to Raven, Disney Channel’s “65-episode rule”—which almost invariably led to the cancellations of Disney originals once they hit that magic number—was applied to its animated and live-action series alike. The 65-episode model was primarily based on how Disney schedules its programming. With five original episodes each week, a 65-episode run allows new episodes for 13 weeks, allowing Disney to shuffle new properties in and out of rigid, quarterly slots. Even though Disney’s live-action series—like Lizzie McGuire, The Famous Jett Jackson, and the Shia LaBeouf vehicle Even Stevens—premiered new episodes weekly rather than five days a week, Disney canceled all three after the 65th episode, leaving loyal fans frustrated and clamoring for more. But after becoming the highest-rated original in the channel’s history, Raven broke way past the 65-episode barrier, making it Disney’s first series to hit broadcast television’s 100-episode syndication threshold. Its record for longest Disney Channel run has since been surpassed by Wizards Of Waverly Place, but Raven laid the foundation for the latter shows to live longer than it would have had it premiered five years earlier. Raven began life as a pitch from Michael Poryes and Susan Sherman (who retained creator credits) called The Future Is On Me, a similar premise without a specific actress in mind. The title was later changed to Absolutely Psychic, and became That’s So Raven after Raven (as she was billed in the credits) was cast in the lead role. Interestingly, Raven initially auditioned for the role of Chelsea, the lead character’s ditzy best friend, but producers were so impressed with her, they gave her the starring role instead. The role of Chelsea went to Anneliese Van Der Pol, while Orlando Brown was drafted to play Raven’s co-BFF, athletic, girl-crazy Eddie. Raven’s unprecedented success suggests the show did something out of the ordinary. But it hewed to the shopworn premise followed by Sabrina The Teenage Witch and so many other comic-book franchises, in which extraordinary adolescents deal with abilities or circumstances that should theoretically make their lives easier, but usually wind up having the opposite effect. Raven Baxter is a typical high-schooler in every way but one: she has psychic powers. 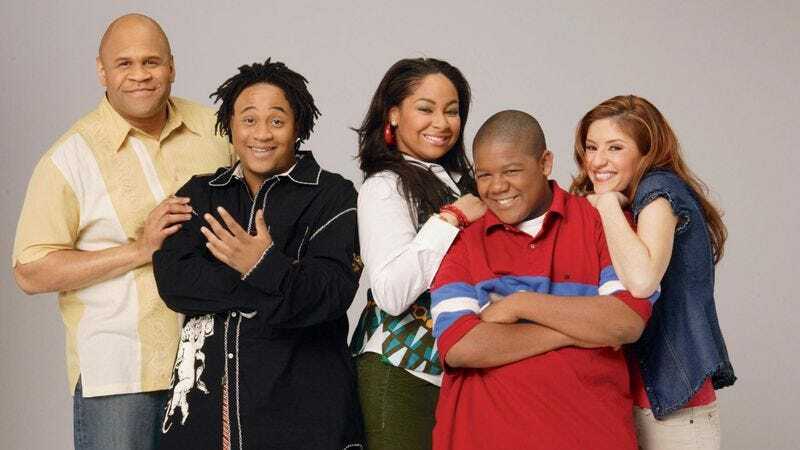 Raven’s prophesies are a closely guarded secret, with only Chelsea, Eddie, Raven’s goony little brother Cory (Kyle Massey), and their parents Victor and Tanya (Rondell Sheridan and T’Keyah Crystal Keymáh) in the know. The show never delves into an origin story for Raven’s powers, and at no point does the character question the origin or grander purpose of her ability. Raven’s visions are not predetermined, and she’s often able to derail them by directly intervening. But she rarely tries to control the power or direct it toward a specific goal. At the show’s starting line, Raven has already accepted that her spontaneous, fleeting, and context-free glimpses of future events are a fact of life, for better or worse. The show’s most powerful supernatural force is the chemistry between Raven, Brown, and, Van Der Pol, whose collaboration even extends to the show’s theme song, which they performed together. The success of a sitcom about a group of friends is often attributed to the real-life friendships between the castmates, and the Raven trio has the kind of natural give-and-take that makes the audience assume the relationships exist off-camera. Indeed, when Brown, Van Der Pol, and Massey joined Raven on The View in September 2015 for a mini-reunion, their chemistry endures, and they spoke openly about maintaining their friendships in the years since the show ended. Raven is at its best when the three characters are sharing a plot, as in season two’s “A Goat’s Tale,” in which they conspire to conceal their rival’s barnyard mascot after Eddie kidnaps it, and “Out Of Control,” in which Raven has a vision she interprets as evidence of a secret affair between Eddie and Chelsea. The supporting characters in Raven’s family are equally well-cast, especially Massey, who has his own knack for physical comedy and costumed clowning. In another first, Massey and Sheridan went on to star in Cory In The House, Disney’s first spin-off sitcom. House had its own elaborate premise, in which Victor, a professional chef, gets drafted to work in the White House kitchen, and Cory comes to live there with him. The spin-off managed to last two seasons before its ratings petered out leading to its cancellation, but that it made it that far speaks to just how successful Raven was for Disney. In addition to its massive ratings success, Raven was a two-time Emmy nominee, and it became a merchandising powerhouse for Disney. The show inspired dolls, lunch boxes, soundtracks, a fragrance, a clothing line, a long-running novel series, and several video games. It’s a hugely impressive legacy for a children’s show with such a wistful tone. Despite its typically goofy nature and broad, kid-friendly comic sensibility, Raven is surprisingly world-weary compared to its peers. Where similar shows have given their protagonists at least a few episodes to enjoy their unusual situation before piling on the complications, Raven was immediately faced with ethical challenges with regard to using her powers. In episode three, “Test Of Friendship,” Raven’s limits are tested when she sees a vision of Eddie getting an F on his Spanish midterm, a grade that would disqualify him from the school basketball team. Raven withholds the information while she considers her next move, and when she confides in Chelsea, she realizes her vision has left her with perfect recall of the test’s answers. As Raven and Chelsea consider whether Raven should help Eddie cheat on the test, she’s already expressing ambivalence about her powers: “I want you to be the one who’s psychic so I can be the one to say ‘So what are you going to do?’” Chelsea’s reply: “So… what are you going to do?” “Friendship” exemplifies the rigid template for a typical Raven episode. Even when Raven’s frustratingly narrow visions lead to standard sitcom fodder like mistaken identities and romantic misunderstandings, there’s usually some kind of moral calculus at play as she grapples with if and when to turn her prophecies to her advantage. The story plays out, as Raven’s misadventures always do, with Raven (and in this case, Chelsea) donning a ridiculous costume and going to some pratfall-friendly extreme to correct her mistake. In this case, that mistake is giving Eddie the answers to the Spanish exam only to learn that the teacher switched it with another test at the last minute. The third act finds Raven trying to alert Eddie to the test swap, which eventually leads to Raven and Chelsea posing as window washers outside Eddie’s classroom. The window-washing basket goes askew, sending Raven and Chelsea swinging, and showing the another glimpse of the show’s most potent weapon: Raven’s talent for physical comedy. Child stars don’t always make convincing, compelling actors once they get older, especially since so much “precocious kid” humor comes from the writing more than the performance. But Raven is an incredibly gifted physical comedian, and the show plays to that strength every opportunity it gets. Raven is the closest television has come to a modern-day I Love Lucy, anchored by a truly game actress who will happily take a tumble, cover herself in goo, or some combination of the two if it’ll get a laugh. The moral implications of Raven’s ability are such a strong element of the show that they cancel out the wish fulfillment inherent to the premise. Raven is never allowed to cleanly prosper from her visions, and when she tries to use her visions to gain a leg up, the plan usually backfires. In the season one episode “Psychics Wanted,” Raven is recruited to come to work for a fraudulent psychic hotline—a nod to “Miss Cleo” and the infamous Psychic Readers Network—and she initially resists before finally relenting, hoping she can use her paycheck to take a crush to a jazz festival. Unexpectedly, the object of Raven’s affection ends up on the line with her, and instead of giving him accurate advice about the jazz scholarship he’s angling for, she tells him what he wants to hear, then tries to steer him into dating her. The plan goes awry, Raven doesn’t get her man, and she is reminded once again that life works best when it unfolds naturally, not supernaturally. Raven, like Lucy before it, was built for longevity. Its character development is non-existent and its plots are repetitive. The biggest shift in its storytelling came in season two, when Victor opened The Chill Grill, a The Max-style teen hangout restaurant that gave Victor a more active role and provided a new interior setting. Raven’s episodes were so interchangeable, they never aired in order of production, or anywhere near it, for the show’s entire run. But while the show’s approach to storytelling made it impervious to age, it was also limited by the high school setting. Any show about high school kids has to figure out how to extend the premise after high school is over, and rather than tackle that issue, Disney ended the show instead. There was also the matter of Keymáh, who left the show after season three because of her dissatisfaction with her character’s direction. Though Tanya’s absence isn’t readily felt, the characters occasionally refer to how she’s in England pursuing higher education, and nothing makes a show feel more dated than dubious explanations for a character’s abrupt absence. But by the time Raven hit its fourth year, it had already changed Disney Channel for the better. By opening the network to the idea of open-ended runs for its shows, it set the stage for such future successes as Hannah Montana. (Saturday Night Live’s “Disney Channel Acting School” sketch pays hilarious tribute to Raven’s legacy.) But it wasn’t just a matter of arriving at the right moment. Raven succeeded because it’s one of Disney’s most consistently and durably funny shows, the rare example of a charismatic child actress actually improving once she became a young woman. Who would have seen that coming?